For a restaurant called Not Your Average Joe's, our meal was pretty average. 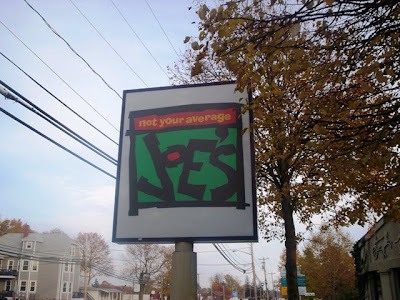 I used to frequent Not Your Average Joe's on a regular basis with a friend of mine. At the time I did not have my driver's license, but promised my mother that as soon as I passed my exam, I would take her to eat at this trendy chain restaurant because it was so hip and cool. Eight years later, I finally brought her. Only this time the allure had worn off, and that friend that I used to have has evaporated into thin air. We pulled into the extraordinarily busy parking lot of the Dartmouth location at around 2:30 p.m. 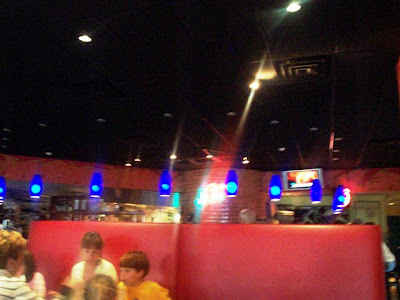 If you're looking for a quiet restaurant with a calming interior, do not visit Not Your Average Joe's. 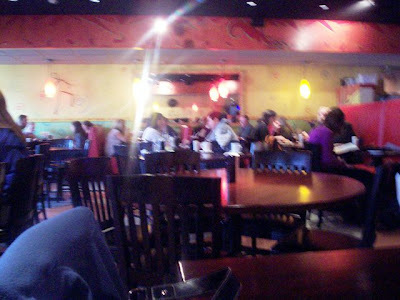 The restaurant is almost always loud and frantic and the decor is very bold and eclectic. I guess it's a typical chain environment. Mom and I had to wait to be seated for a few minutes, but were soon shown to a table by a friendly hostess. She left us with two plastic-covered menus while we waited for our waitress to arrive. After a few minutes, a girl named Ashley B. came to the table with an order of the restaurant's famous bread and dipping sauce (featured on The Phantom Gourmet). She took our drink order - two diet colas - and returned with them in real glasses. I started devouring the bread right away. I had told Mom about the bread and dipping sauce being one of my favorite things at Not Your Average Joe's. She agreed. 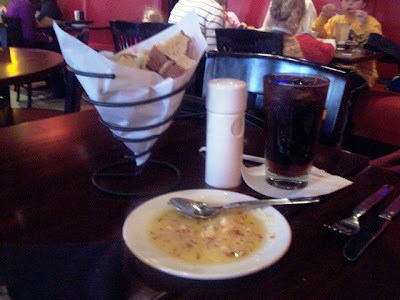 The fresh artisan bread came in a decorative basket and was accompanied by a plate of oil and garlic dipping sauce. It also came with some pepper that you could grind over the oil. It was so delicious that I couldn't keep away from it! Since Mom had already checked out the menu on the Internet, she already knew what she wanted. The problem was that she wanted a bunch of different things. When Ashley took our order, Mom had finally settled on the Angus sirloin burger with bacon and jack cheese ($9.50). The dish came with a side of fries, and Mom asked for the burger to be cooked medium well. I chose the chipotle chicken salad ($9.95), which was one of Mom's "maybe" choices. Ashley took away our menus and left Mom and I to check out the decor. The interior is very cute, but I almost think that they are trying too hard to be "hip." There is a mixture of tables, booths, and banquettes, and unfortunately I couldn't get that great of a photo because the restaurant was filled with gawkers. Not Your Average Joe's has a beautiful bar area with low, modern lighting that always draws a crowd. I think that this restaurant caters to the college set because I always see a lot of young, pretentious people in there talking about their classes and various vacations they've gone on. I can't stand overhearing morons talk about how great they are, but they seem to be everywhere at Not Your Average Joe's. I will say that the restaurant is very small, but does its best to seat as many customers as comfortably as possible. When our food arrived, both dishes looked great. Mom's burger was cooked just the way she asked (medium well) and was quite tasty. The bacon and cheese on top added to the nice flavor of the meat. Mom really enjoyed the burger, but mentioned to me that the fries were not that great. She said that they were luke warm and limp, which made for a disappointing side to an otherwise tasty meal. 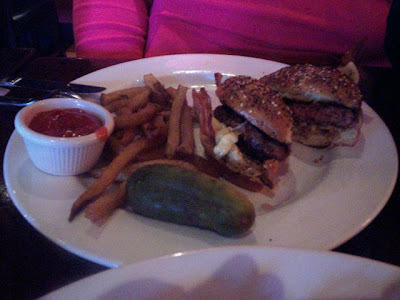 Her dish also came with a small cup of ketchup for the fries, and a large pickle (which I devoured). 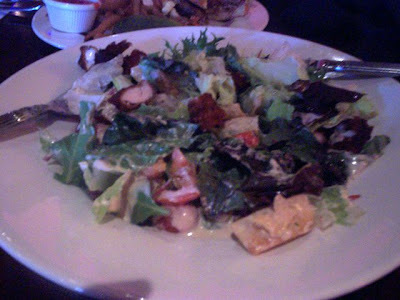 As I was eating my salad, I realized that - although it was very tasty - there was nothing overly special about it. The greens were fresh, and the tangy dressing was a nice touch against the well-cooked chicken pieces. As good as the salad was, it really didn't do anything for me. It was just your basic chain restaurant salad that unfortunately costs almost $10. Notice anything? Well, I didn't until I started doing this review. We had not been charged for our soft drinks. This actually happens quite a lot in restaurants. I can think of several places that we have dined at recently that have neglected to charge us for drinks. That's fine, but perhaps the waitstaff should be a little more careful because - according to some people I've talked to - any missing money comes out of their own paychecks. Either way, we left $25 on the table for Ashley, which included a 20% tip. Before heading out, Mom and I visited the restroom. Although the stalls were clean, the sink area was a bit messy (we did see someone attempting to clean it). Mom and I are actually still trying to figure out why we weren't thoroughly bowled over by the Not Your Average Joe's experience. Perhaps it was because we are used to eating at places that aren't so cold and "artsy fartsy". Mom and I tend to dine at places that give you a warm, welcoming feel when you walk inside, and we definitely missed that today. I'm sure we'll be back at some point - like perhaps in another eight years. In the meantime, we'll stick to the restaurants that serve early-bird specials and cater to old biddies like us. 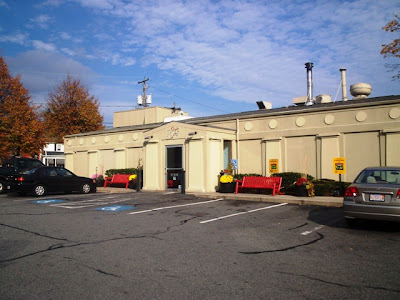 The Not Your Average Joe's location on Dartmouth's State Road is open from 11 a.m. to 10 p.m. Monday through Thursday, from 11 a.m. to 11 p.m. on Friday and Saturday, and 12-9 p.m. on Sunday. 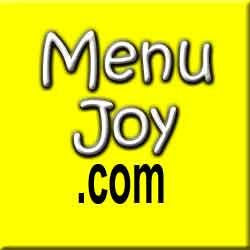 More more information such as locations and hours, visit the Web site at www.notyouraveragejoes.com.